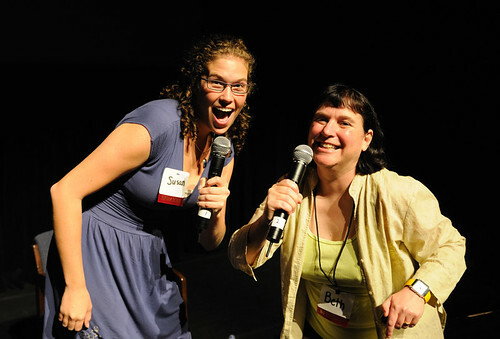 Susan Gordon & Beth Kanter, originally uploaded by Craigslist Foundation. Over the weekend at Podcamp Boston 4 (which sadly I was unable attend because I moved from Boston), I caught a tweet from colleague Chris Abraham coining a term called "Reputation Dysmorphic Disorder." It's when people don't like to share their own work for fear of being called a self-promoter. Chris thinks that people with this disorder should get over it because it means that their colleagues are missing out on them sharing their ideas/work. I wasn't going to write about this on my blog but decided to take Chris's advice. In June, I had the pleasure of co-presenting a session called How To Think Like A Social Media Marketing Genius at Craigslist Nonprofit Bootcamp with Susan Gordon from Causes. (My live blog posts here). We posed for this photo after the session. Susan is much taller than I am, you can't really see it in the photo. It must have been striking to see us on the stage from the audience because some of the evaluation comments came back as "The short one ..." "The tall one ..." One pattern that was interesting is that negative comments referred to us in that way, while positive ones used our names. The podcast from our session can the Craigslist Foundation site and our slides can be found here. With enough time, I could actually make a audio version on slideshare. 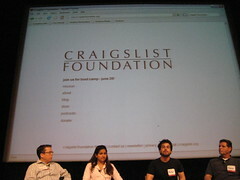 David Lapiana also did an interesting video project at Craigslist Bootcamp. They did a series of video interviews asking folks what the nonprofit of the future might look like. You'll find these interviews on David's YouTube Channel. My interview is here. Photo taken by Jake Brewer. 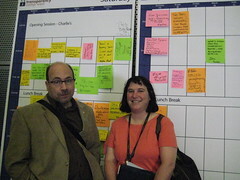 Over the weekend, I got to meet Craig Newmark at transparency camp. Jake Brewer was kind enough to snap this photo. One of the best quotes of the day came from Arianna Huffington who said, "To be generous, practice generosity." She shared some powerful stories from the heart, and also mentioned that we shouldn't think we're too small to make a difference. "If you've ever been in bed with mosquito, you know that isn't true." She also announced that the Huffington Post has a new living section which feature the stories of people volunteering, raising money for causes they care about, and other inspirational stories. I attended a session on Future Tech with Peter Deitz, David Greenberg, Ramya Raghavan, and Marnie Webb. My notes are here. My take away was from something that Marnie Webb said, "The new tools allow people to self-organize, something that nonprofits have been great at doing. Nonprofits can no longer ignore these tools or they risk becoming irrelevant." At the ending "All Star" panel, there was a moderated conversation with 7 luminaries, including Ami Dar and Steve Wright. Some key themes were focus on relationships and how to encourage other people to volunteer or give way to their communities. I was surprised that they didn't involve the audience in the conversation, by not doing this Oprah style or simply reading and responding to some of the tweets. Nonelethess, it was an inspiring session to hear what the experts had to say. Craig Newmark answered the question "How do we encourage more to give something back to their communities or volunteer using the new web tools?" He jokingly said something like (and I'm paraphrasing) that asking a nerd like him to talk about how these tools can help do more good is like a crime against humanity. I think he was saying that he sees so many possibilities and so much potential and is so passionate about just that that he could talk about it for hours. What he did say that was very important - to encourage generosity we must all become nudges" - that we tell the stories of generous acts by people doing something everyday. A 50 day event from December 2007 through January 2008. The Case Foundation provided awards to participants who raised the largest number of friends, not money, every day and in total by the end of the Challenge. The Challenge raised $1.8 million from more than 71,000 donors, benefiting thousands of causes. What Allison and I discovered is that the winners all came from nonprofits that all-volunteer run or had budgets of less of $1 million. As one of the winners, the Sharing Foundation, I have shared my lessons learned and techniques very widely and inspired others to not only raise money for my charity - but also try it for their particular Causes. As part of the reflection paper, Allison and I interviewed scores of participants to learn what worked and why. The structure of the Challenge lent itself to leveling the playing field and enabling smaller groups to be successful. 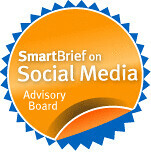 Those key elements included the use of Causes on Facebook that enables smaller groups to connect friend-to-friend at no cost, the short time frame that enabled smaller groups to hang in there and give it all they had for a limited albeit exhausting, period of time, the urgency of the Challenge created by the significant matching dollars offered by The Case Foundation, and the leader board that enabled everyone to see how they were doing and spur their volunteers to do more to keep up with the competition. The winners were able to make their efforts go viral, meaning friends of friends were working on their behalf to support their Challenge efforts, because they had talented individuals who spent an enormous amount of time as network weavers and cheerleaders-in-chief. The winners had an inner circle of volunteers who outworked less successful groups not by a few but by hundreds of hours. Winners pushed power to the edges through their social networks and were agile, real-time learners. Winners didn’t have set plans when they started, they just started. Friends of friends blogged on their behalf, sent text messages, walked dorm room to dorm room laptop in hand raising friends, asked their office colleagues for help. There was no one right way to win the Challenge and all of the winners had a robust mix of online and on land efforts and learned in real time throughout the Challenge how best to connect with their friends and potential supporters. Personal connections were critical in activating the viral effect of successful cause efforts – by large margins (between 61-74%), cause champions reported reaching out for donations and outreach assistance to people they knew personally, including known supporters, family, friends and colleagues first to spread the word and encourage participation in the Challenge. Most winners reported that the friends that they raised during the Challenge were new donors to their organizations. The urgency of the effort enabled groups to turn friends into funders. This is a critically important finding not only for the Challenge but for groups using Causes on Facebook. The America's Giving Challenge ended on January 31, 2008 and the idea of using social media and social networking tools has taken off. We're seeing more organizations and individuals use these tools and more organizations set up giving competitions and events that encourage the use of these tools for good causes. Take for example, the Summer of Social Good initiative recently launched by Mashable. I hope you’ll have a chance to read the report. I’d appreciate your reactions and ideas as would The Case Foundation as they prepare for the next Giving Challenge later this year. View more OpenOffice presentations from kanter. As promised, I'm posting the slides from the session that Susan Gordon from Causes and I gave this afternoon at Craigslist Foundation Nonprofit Boot Camp Thanks! When it comes to technology, the future is now. The Future Tech panelists are experts in the development and implementation of new technologies that work for the social good. Learn about both community-driven and corporate tech initiatives that help you make a difference in your own communities, and hear about the opportunities and challenges of taking on cutting edge technology tools. YouTube video volunteers channel - a video version of All for Good - get video volunteers to create content for nonprofits. It will be launching in a few days. Book sprint for "Understanding CivicCRM" sat together for five days and wrote a 300 page book - download for free. Pay for the print version. There's a move to make it easier for people to find opportunities to take action. Two trends: Technical side increasing openness in API, RSS, etc. Cultural shift afoot - technology companies, media, and bloggers using their influence to meaningful action. Endless possibilities. Very exciting. He shared some recent examples, including those from Netsquared. You can find them here. The future how to explode what happens online and do something more intentional. How do we set the backends of our systems take advantage? How do we access the YouTube the celebrities to make us better story tellers? How do take platforms and bring it altogether? How can activist all these nascent networks to make change? Facebook is better at organizing people than nonprofits. Non profits can no longer ignore social media or they risk becoming irrelevant. .